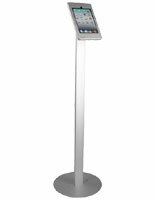 Need a sleek, freestanding display for commercial or business environments? 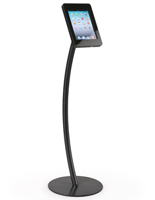 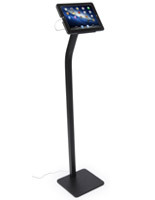 These iPad Air kiosks are made for holding Apple® tablets with style. 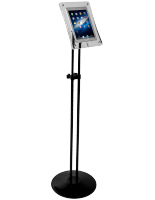 Each stand features a modern finish of black, silver or white that complements any interior. 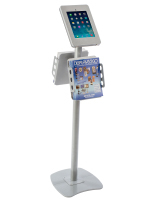 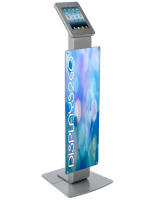 iPad Air kiosks are great for creating interactive showcases in stores, restaurants, bars, offices and museums. 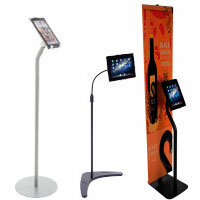 With slideshows, videos and apps, anyone can easily merchandise goods and inform customers. 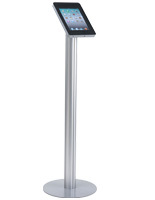 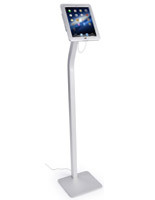 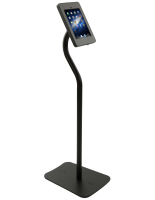 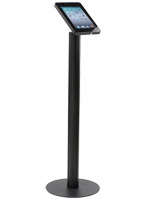 Specifically, these iPad Air Kiosks, or floor standing touchscreen pedestals, can showcase digital catalogs, restaurant menus, surveys, sign-in sheets, and promotional presentations. 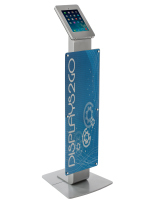 Enclosures like these come with an assortment of features that make them ideal for any environment. 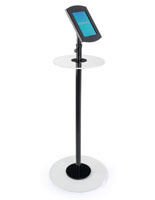 What options are available with these freestanding tablet fixtures? 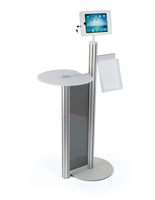 Locking iPad Air kiosks feature a secure enclosure that prevents theft and tampering. 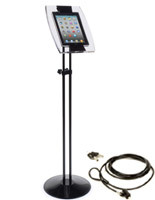 These holders use a key or Kensington cable with a combination lock to protect their contents. 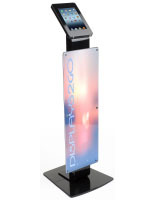 Additionally, each display offers a strong steel or aluminum construction to prevent break-ins. 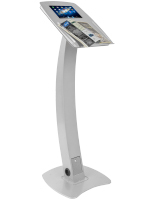 Some models feature a dual locking design for extra security. 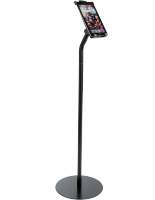 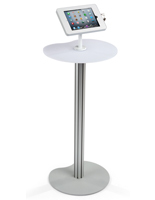 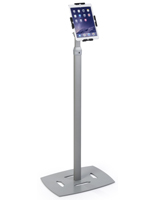 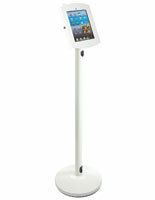 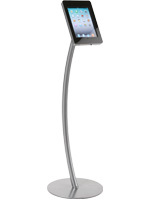 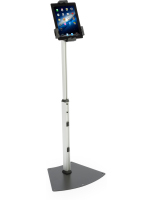 These floor standing pedestals can also come with an movable bracket that adjusts to accommodate any user. 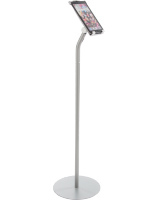 Some models can tilt 90° and rotate a full 360° to face any direction. 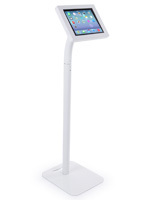 These are especially useful because they allow touchscreens to be showcased in a portrait or landscape orientation. 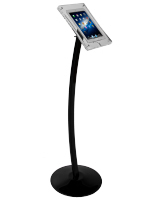 Some fixtures are also available with a height adjustable stand for even more viewing options. 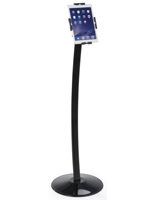 Additionally, pedestals can come with a flexible spine that allows for versatile positioning. 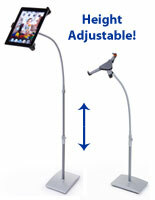 The neck will keep its shape and remain stable with its weighted base. 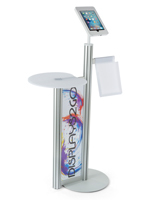 Kiosks are also available with the option of concealing the home button. 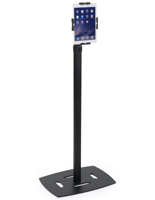 Hiding it is useful for retail stores and other public environments because it prevents customers from navigating to unauthorized apps. 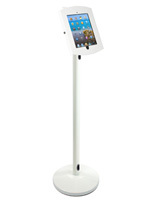 Some units feature an adjustable cover that can show or hide the home button. 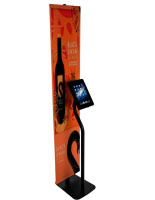 Floor standing device fixtures with a literature shelf are great for dispensing additional information in stores or at trade shows. 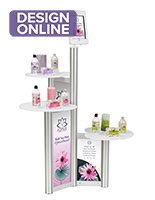 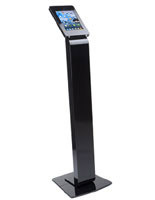 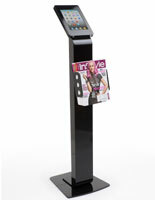 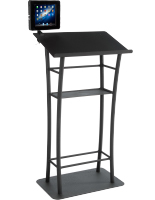 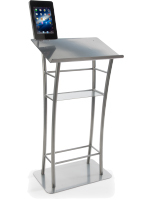 Magazines, brochures, and catalogs can be put on display for visitors, or alternatively, the pedestal can be used as a podium for presentations. 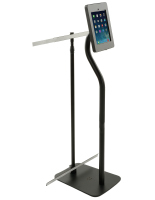 Each lectern features a device enclosure and an area for holding notes that makes it excellent for presenting. 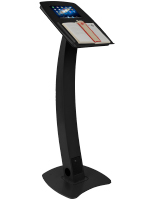 Most kiosks include a cable management system for additional ease of use. 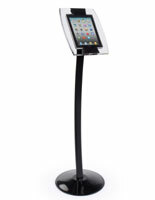 These units give access to the charging port to keep the touchscreen’s battery full while on display. 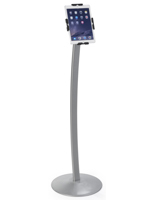 The cords are hidden in the base to prevent passersby from tripping on loose cables. 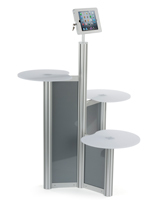 Some models with a wide stand can accommodate a power strip for saving additional space. 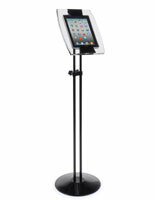 These floor standing tablet enclosures are excellent for creating a dynamic showcase in any setting. 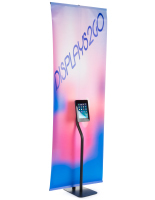 With the number of apps on the Apple® Store, devices can act as check-out counters, time clocks, restaurant waitlists, digital catalogs and much more. 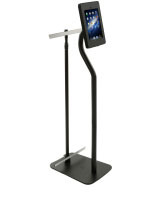 Order one of these versatile holders today to turn any handheld computer into an interactive merchandiser!